A zesty and spicy lime rice pilaf made with jalapeños to give the standard rice side dish a bit of a kick. Both gluten-free and vegan. I’ve been cooking all sorts of complex meals for years now, and still I cannot get a pot of regular standard white rice to cook perfectly. It comes out a bit mushy or dry or undercooked every time. Does this happen to you too? Makes no sense to me. How complicated can rice be? Just rice and water right? Well there seems to be so much more that goes into it. My mom never even bothers to even attempt to perfect this delicate balance. She puts her full faith into the rice cooker, and that magical little machine has never let her down. Not sure what the rice cooker can do that I can’t but in that device the rice truly does cook perfectly every time. On the stove top though? Not in a million years. So, if I’m making rice on the stove top it is always always always a rice pilaf. Something about rice pilaf makes it about 100 times more forgiving than regular rice, and when I make it there’s lots of room for error, and therefore mine comes out perfect every time! Something about toasting the rice first with other ingredients, allows me to get the cooking process right, but if it’s just water and rice, something always seems to go wrong. Also isn’t rice pilaf just so much more interesting than regular steamed rice? It’s perfect for a dinner party – it takes little to no effort to make but actually makes for a flavorful and interesting side dish. I have my go to favorite onions,almonds and parsley rice pilaf, but I wanted something with a bit of a zesty spice kick, and a different flavor profile. Lime and jalapeños seemed like the perfect duo. A bit of a Mexican flair going here with this lime rice pilaf. Be careful with those jalapeños though – I always remove the seeds to make sure they are not too spicy for my palate. If you can handle the heat though, feel free to keep those seeds in. Whatever you do though, do not go to scratch your eyes immediately after cutting jalapeños – trust me, I’ve made this mistake before and it’s not pleasant. Now my secret to perfect cooked rice every time is to toast it in a bit of olive oil before adding in any water. With the addition of jalapeños, lime zest and juice the rice takes on a spicy flavor with a citrusy kick thrown in there as well. I love the magical effect of lime zest added to just about anything. It truly makes any dish pop with freshness and bold flavors and I cannot stop myself from adding it to just about everything. Once the rice is cooked I like to add in a bit more olive oil, just to add in even more moisture into the side dish and help fluff it up a bit. 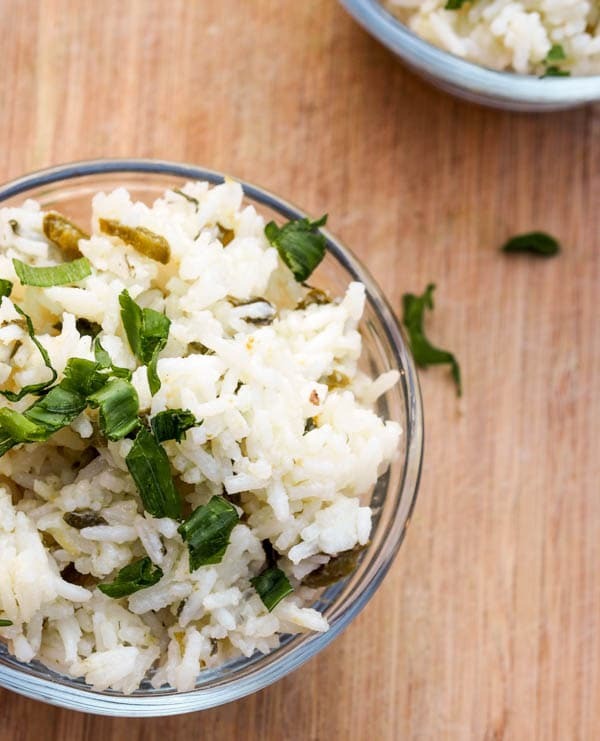 And voila that’s all you need, just a few ingredients, and less than 30 minutes to get a delicious zesty and spicy lime rice pilaf side dish on the table. This makes for the perfect accompaniment to any Asian or Mexican themed meal, whether that’s salmon in a curry sauce or a mongolian beef type of dish. What’s your secret to perfectly cooked rice every time? 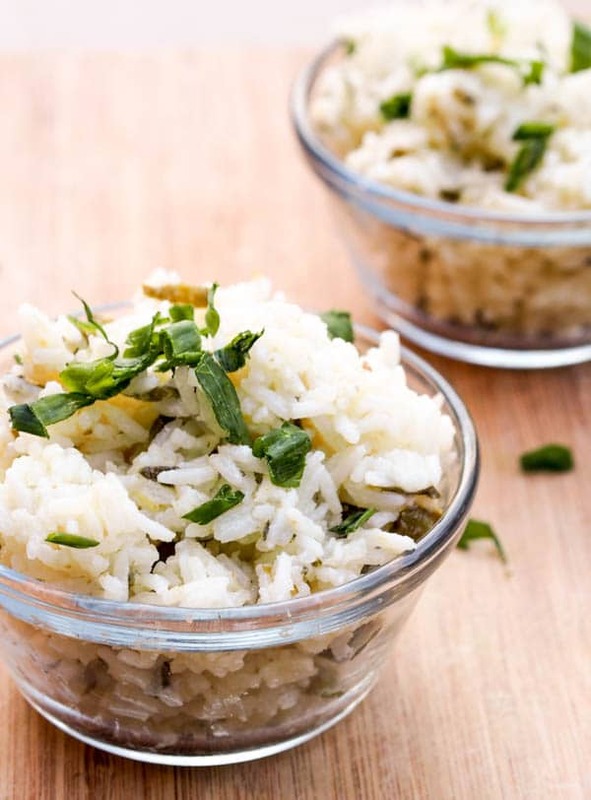 Do you have any favorite rice pilaf recipe combinations? Feel free to share in the comments below! I’m always looking for more rice pilaf combinations to try out! A zesty and spicy lime rice pilaf made with jalapenos to give the standard rice side dish a bit of a kick. Both gluten-free and vegan. Heat small pan over medium heat and add 1 tablespoon oil. Cook jalapeno for 30 seconds add rice and continue to cook for 3 minutes until lightly toasted, stirring occasionally. Add lime juice and zest. Stir to continue. Add 2 cups water, bring to a boil, add salt to taste, reduce heat to simmer and simmer covered over low heat until cooked through, about 15-20 minutes. Add additional tablespoon of olive oil. Fluff with a fork and serve.